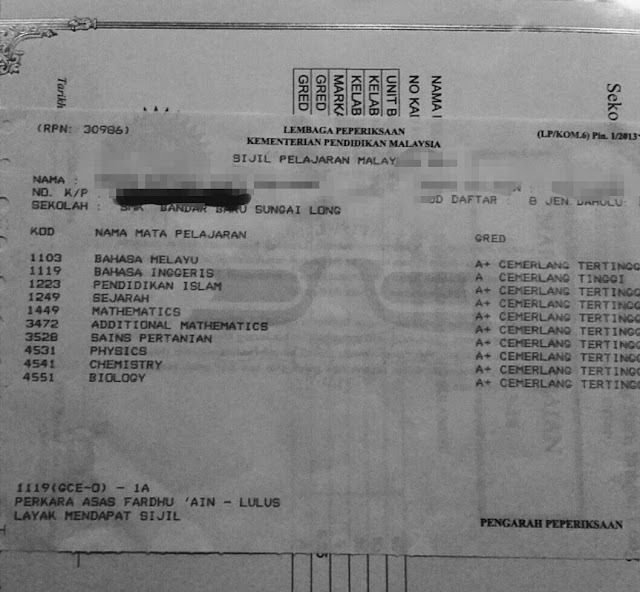 Acquiring a bundle of straight A’s was definitely every SPM student’s dream alongside their parents’. However, we must be willing to perform sacrifices from our other aspects of life in order to do so. Sometimes, we might even have to give up doing things that we like in order to creep closer to our goal by doing things which are productive, specifically studying our hearts out. In no means of bragging, as a straight A student, I can tell you that I did not see that I’ve achieved much in life after the final day of the SPM examination as most of my time is spent into books; doing revisions, exercises, memorizing facts, etc. I realized that I missed out so much on life prior studying for my SPM. After six lazy months of my Form Four year, I’d became enlightened to study in a “serious” manner. I thought it was time to start because early preparation never hurts… right? Unfortunately it was also signaling the start of my torment as this little “quest” of getting A’s in SPM began. As I started my “serious” study, I gave up my habits of exercising, and learning martial arts. So, for one and a half years I did not touch any track shoes or put on any boxing gloves. As a direct result, I got chubbier and gained some weight alongside a “one pack” ^_^ . Aside from that, I gave up on many plans I have in the future like parkour, learning to play the piano and guitar, and swimming. Like reading a storybook, once you find it interesting, you’ll also find it addicting to read. The same thing goes for studying when we really need to read carefully and understand the smallest details to get the big picture. And when I did, I do exercises (not the physical, the books ^_^) excitingly and addictively until I most of the time, lose track of time. So I might begin studying at 10PM thinking to do some revisions before going to bed and realize it was 1AM or 2AM without having the intention of studying that long. Eventually it became a habit and I lost my sleep hours quite frequently and be sleepy at school especially during classes and became completely stressed out. Eventually I even have trouble sleeping and have my eyes wide opened till daylight shines. 3. Neglecting family and friends. I realized in the period I’m “seriously” studying for my SPM, I’m also seriously neglecting my friends and family. I stopped going out for fun activities with my family, even for trips which they claim calms me down from studying although it will not. At school, I did not spend much time socializing with friends and brush up my poor social skills which I thought was not useful for the simple and narrow minded reason I do not wish to be a businessmen. But good social skills goes a long way than becoming a businessmen. So now, I lack friends I might say, lol. High school should be a place we socialize and create everlasting friendships, bonds and etc. while at the same time study. I put the weightage too much on studying that I miss out chances of getting to know the girls of my interest a little better. I do not find this necessary but I think I lack a love life somehow lol. 5. Abusing my personal needs and emotions. As I study and lose track of time, I will also sometimes skip meals. Very unhealthy habit as I might develop gastric. Additionally, when I do eat I opt for quick unbalanced meals in the vicinity like the my school canteen’s oily fried noodles, bland fried rice, nasi lemak or fast foods like Domino’s Pizza or McDonalds’s for the simple fact that I do not need time preparing my food, “wasting” my precious time in the process. I, at that time would rather spend my time studying as I get one step closer to my goal. I write this article in no means to discourage you in studying and getting straight A’s. Getting straight A’s can be easy and sacrifice-free if you are able to balance all the important aspects in your life wisely while putting a load of efforts studying, or you can be a genius and not study and get straight A’s in your SPM. Just kidding but anyway, genius or not good luck for your SPM!